This year, the northern hemisphere winter solstice will fall on 21 December in Britain. On this date there are the fewest hours of daylight and the Sun is at its lowest maximum elevation. The origin of the word solstice is from two Latin words: sol, which means Sun, and sistere, to stand still. At the time of the winter solstice the Sun stops getting gradually lower in the midday sky on successive days, appears to stand still at the same height for a few days, and then starts to get higher in the sky. The reverse is true for the summer solstice. At this time, the Sun stops getting higher in the midday sky on successive days, appears to stand still at the same height for a few days, and then starts to get lower in the sky. 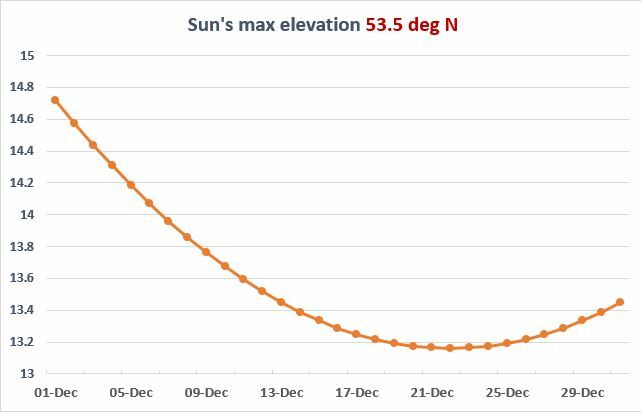 The graph above shows the maximum elevation of the Sun, measured in degrees during December 2018. This data is for Manchester which lies at a latitude of 53.5 degrees latitude North. The fact that the Sun’s elevation changes very slowly in the days around the solstice also means that the total hours of daylight change very little. This is shown in the table below, which gives the sunrise and sunset times and the amount of daylight in hours, minutes and seconds for Manchester. Data from Time and Date (2018). The diagram below shows the Earth’s orbit around the Sun. For clarity the sizes of the Earth and Sun have been greatly exaggerated in relation to the Earth-Sun distance. During June, marked as Ain the diagram, the Earth’s North Pole is tilted towards the Sun and the days are longer in the northern hemisphere. During December, marked as Cin the diagram, the Earth’s South Pole is tilted towards the Sun and days are longer in the southern hemisphere. At points Band D, known as the equinoxes, neither pole is tilted towards the Sun and the amounts of daylight in the northern and southern hemisphere are equal. 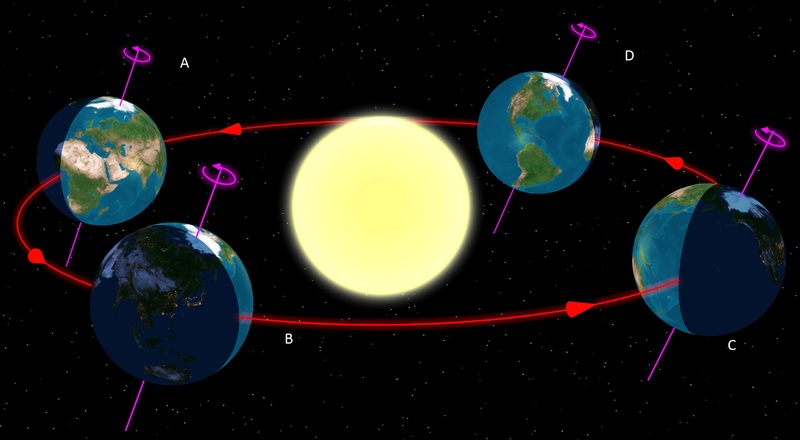 The precise astronomical definition of the December solstice (the winter solstice in the northern hemisphere) is the exact point in time when the North Pole is tilted furthest away from the Sun. 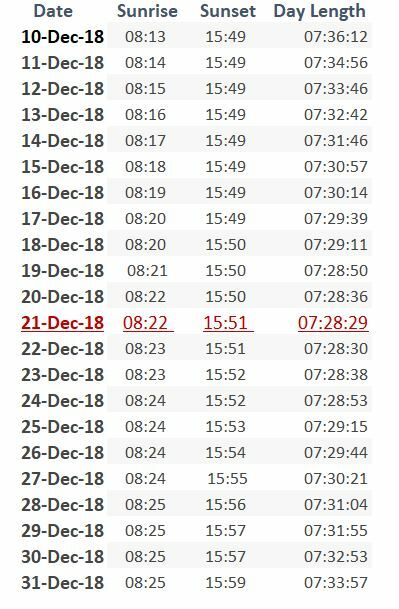 Many people assume that the solstice always occurs on the 21st, but the actual dates and times for this event over the next four years are given in the table below – in GMT, in Beijing (which is 8 hours ahead of GMT) and in Honolulu, Hawaii (which is 10 hours behind GMT). For the small number of people living in American Samoa in the mid-Pacific, which is 11 hours behind GMT, the December solstice will occur at 11:02 pm on 20 December in the year 2020. Both the winter and summer solstices were of great importance to early man, and many prehistoric sites were built to celebrate them. The most famous of these is Stonehenge in England, which consists of a horseshoe arrangement of stones inside a large stone circle, built between four and five thousand years ago. It is an amazing feat of construction by stone age man; the stone circle is over 30 metres in diameter and its largest stones are more than 9 metres tall and weigh over 25 tonnes. The horseshoe arrangement consists of five arches called triliths, each made up of three stones. The open side of the horseshoe points north east towards a large stone 80 metres away from the main circle. 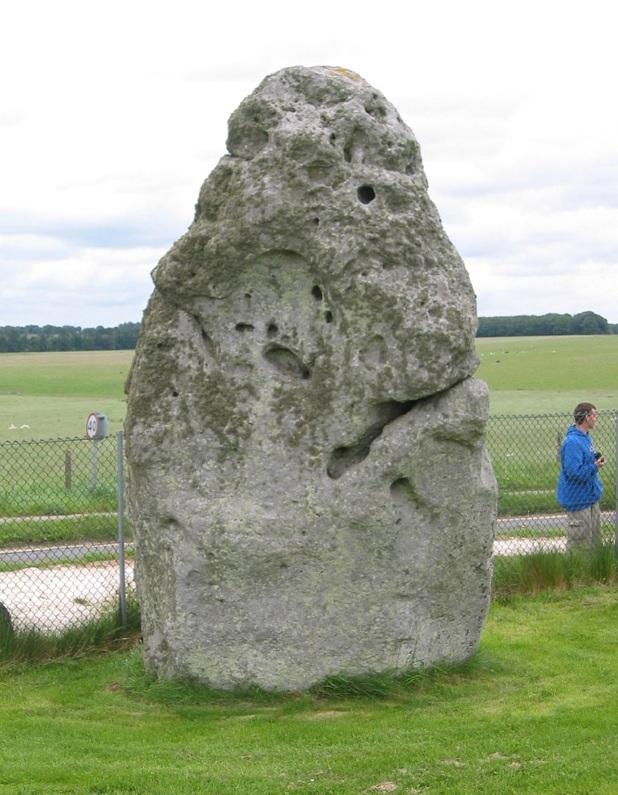 Today this large stone is called ‘The Heel Stone’. 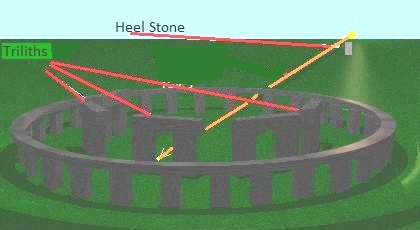 For a few days either side of the June solstice, someone standing in the centre of the horseshoe and facing north east will see the Sun rise over the Heel Stone. How sunrise at the summer solstice at Stonehenge would have looked after the monument’s construction. 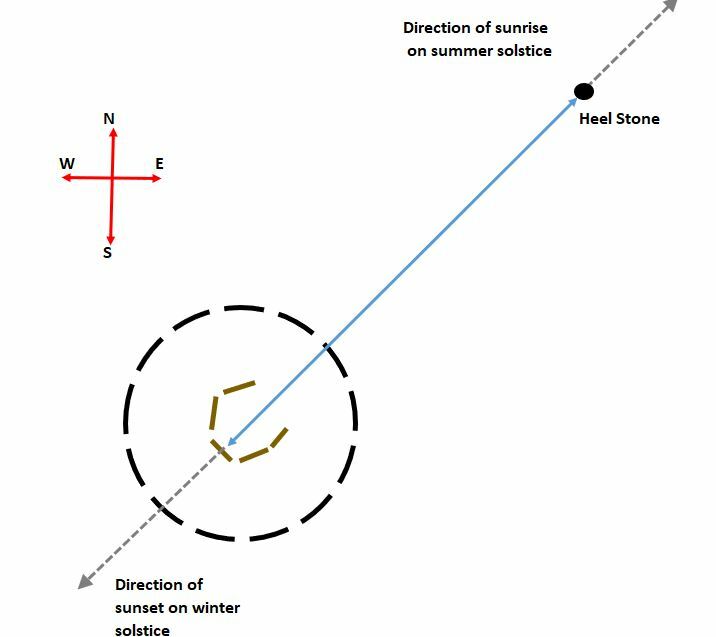 Also, for a few days either side of the December solstice, someone standing at the Heel Stone facing south west will see the Sun set in the middle of the central trilith. Thus, Stonehenge marks both sunrise at the summer solstice and sunset at the winter solstice. It is amazing that prehistoric man built such a large monument to line up with the solstices. However, these would have been major events for a people living outdoors with only natural daylight and whose lives were tied in to the cycle of the seasons. The arrival of the winter solstice signified that although the days would start to get longer there would very likely be a period of colder weather where food would be in short supply for these hunter-gatherers. Over 38,000 discarded animal bones have been found at Durrington Walls, a large Neolithic settlement 3.2 km away from Stonehenge. These remains have been dated to be around 4,500 years old and represent at least 1,000 animals, of which 90% were pigs and the rest cattle. Most of the pigs had been killed at about nine months old. Since the piglets were most probably born in the early spring, they were all slaughtered around the time of the solstice. Some of the bones still had meat attached suggesting that they were being eaten at a time of plenty which suggests that people were gathering for feasts at this time of year. 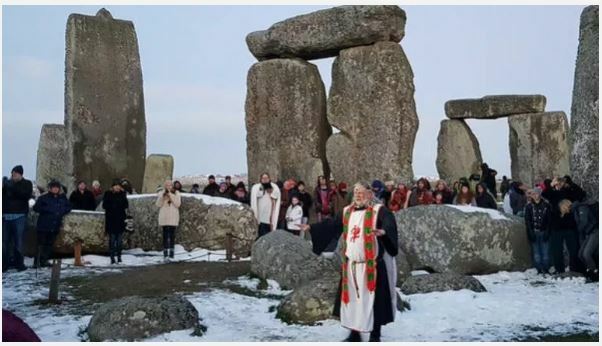 Modern groups with ancient origins such as Druids and Pagans, who revere the natural world more than most modern humans, celebrate the winter solstice at Stonehenge. Each year there is a gathering of several thousand who actually celebrate the first sunrise after the winter solstice, even though Stonehenge is aligned for sunset. To prevent damage to such an important ancient monument it is not normally possible to get right up to the stones. However, English Heritage, the charity which manages the site, opens it up every year from around 07:30 am to 10:00 am in the morning for the solstice celebrations, giving people a rare chance to get up close. For the BBC report on the 2017 Stonehenge winter solstice celebrations click on the link below. To those of you who live in the southern hemisphere the December solstice is the summer solstice, when the midday Sun is at its highest in the sky. After the solstice the days start getting gradually shorter and the nights gradually longer, although the change doesn’t really become noticeable until July. Universal Time, often abbreviated to UT1, is the mean solar time, the time determined by the rising and setting of the Sun at the Greenwich Meridian, zero degrees longitude. Co-ordinated Universal Time, usually abbreviated to UTC, is the time measured by atomic clocks and is kept to within 1 second of UT1 by the addition of leap seconds. In common use, GMT is often taken to be the same as UTC, which is the approach I have taken for this post. However, it can also be taken to mean UT1. GMT is normally avoided in precise writing, because it is not always clear whether UTC or UT1 is meant, and because timekeeping laws usually refer to UTC. Next Post Where does space begin? Interesting. I did not know that about GMT, UTC, and UT1. I’ll have to keep an eye out for those distinctions in future readings. I have had a good look round your blog look very interesting!